The right plaid pattern can be a great way to add some classy character to your wardrobe. Now you can do the same thing to every envelope and package you mail! These attractive return address labels make a fun fashion statement with four appealing pastel color combinations. It's a unique look that never gets old! 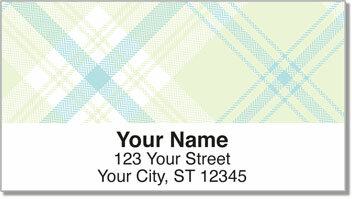 Pretty in Plaid Address Labels from CheckAdvantage are self-adhesive. That means you don't have to deal with the mess of licking and sticking your labels on outgoing mail. It's easy and breezy! Get your very own Pretty in Plaid Address Labels now! You can also order this fashionable selection in a set of matching personal checks!